Funny, right? Except anybody who thinks about it for more than the two seconds it takes to click “Like” will realize how hopelessly and utterly wrong the comparison is. No one at a table ever reached into their front pocket to pull out a newspaper while you were talking to them. Newspapers never vibrated or chimed to get your attention (and no, that waif on the corner shouting “Extra! Extra!” doesn’t count). There’s a finite end point to reading a newspaper, and it usually took no longer than 45 minutes to get there. But the most important difference is what happens after the newspaper was done: people talked to each other about what they’d just read. They could engage in a civic discourse about the news of the day, because they were all reading the same basic material. In contrast, a group of people on their cell phones are all reading radically different streams: They each have their own silo of information, drawn from their Twitter and Facebook feeds, an amalgam of niche interests and friends’ social lives, with no two experiences exactly alike. 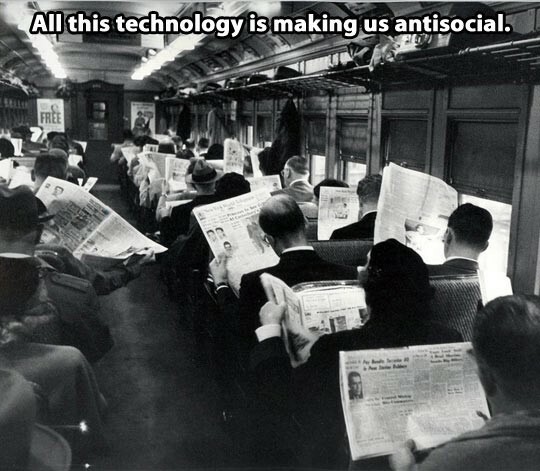 So what you are seeing in that picture of “antisocial” people reading newspapers is actually an eminently social activity: citizens keeping themselves informed so they can participate in the civic discourse of their community. That is what we are losing with the slow death of newspapers. Recently, a landmark study by Portland State University professor Lee Shaker called “Dead Newspapers and Citizens’ Civic Engagement” found civic participation “dropped significantly” in Denver and Seattle after newspapers in those cities ceased publishing. The key part of that formulation is that people are responding to “the same local (or regional) news” — exactly what you can see happening in that picture of supposedly anti-social newspaper readers. That’s not the case when people quit newspapers and depend on cell phones and social media for their news. They end up having much less “news” in common. Ironically, the common bond that has replaced our shared news is image macros like the anti-social newspaper readers picture. You may not be able to name your local City Council members, but you recognize “The Most Interesting Man in the World,” “Bad Luck Brian,” “Ancient Alien Guy,” and the rest of their over-shared ilk. So please, stop spreading this anti-social newspapers meme you’ve been seeing in your social feeds. Doing so is as myopic as posting a photo of a library to demonstrate that we were all overwhelmed with information long before the Internet. Read more stories like this one by following the main Alt Ledes page here. Also, Medium has an app!